Anyway, he finally ran out of Animorphs, and it was a bit before we could make it to the library again so he could pick out some more, so I suggested he try Susan Cooper again. He agreed and took it with him to bed. The next morning, I asked how it went. He made it through two pages and gave up. Was I just out of touch? Was the book not as good as I remembered? I vowed not to give up so easily, so last night I offered to read it to him. We read the first chapter together, and then I said he could keep reading, but my voice was tired. I gave him the book. He read the next three chapters on his own, and he’s off and running now. 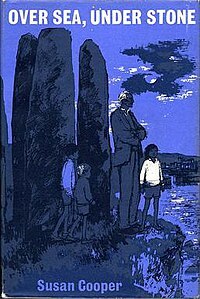 Anyway, once he’s got The Dark is Rising polished off, I’ll start him on Prydain and Narnia, and then it’s just a short jump over to The Hobbit, and we all know what comes after that. Lord of the Rings, baby. I read it when I was in second grade. I’m wondering if TRC can get to it by the end of first. Maybe, if Denisa would stop taking him skiing so often. 🙂 Growing a superhuman isn’t easy, but between the two of us, we’re working at it. Stacy Whitman at Lee & Low Books has bought Bryce Moore’s debut novel Vondnik, for publication in spring 2012 by the Tu Books imprint. The YA fantasy tells the story of Tomas, a Roma boy who returns to Slovakia and discovers that the folk tale creatures he befriended as a boy are more dangerous than he knew, and he must strike a bargain with Death to save his cousin’s life. Eddie Schneider at JABberwocky Literary Agency brokered the deal for North American rights. So they got the name of the title wrong (Vodnik, not Vondnik) but I still thought that was pretty nifty. Nice to see things moving along. I’ll be working on that rewrite very shortly. Can’t wait!